Ready in 30 minutes or less (with a make-ahead dessert!) this Asian-themed weeknight meal is quick, easy and super tasty! An excellent appetizer or light lunch, these wraps are super easy to make and incredibly impressive! Better than any teriyaki you've had before, the beef is super tender and delicious served over rice! What can be more refreshing than lemon bars in the spring? As you know, Glutenfreeda has been a long-time supporter of Chebe products - back when there was only the single, basic bread mix. Now, with a full line of mixes and frozen par-baked goodies, Chebe continues to impress with Focaccia, Breadsticks and Cinnamon Rolls. Ingredients: Manioc (tapioca) flour, modified manioc starch (100% manioc), evaporated cane juice, cinnamon, iodine-free sea salt. Like all of their mixes, the cinnamon rolls come together in just minutes! Just add oil, an egg, applesauce and a little bit of milk or soymilk, roll it out and you're set! If you want to include nuts or raisins, you easily can, and if you don't, they're delicious as-is. While the dough puffs up considerably and looks flaky, I felt like the sticky buns were mostly...bun. As the dough expanded, space was created between each layer, forming a sort of pastry rosette, with most of the filling leaking out onto the bottom of the pan. Still delicious (and significantly better warm!) but not quite the same as a traditional cinnamon roll. As soon as they start the cool, the buns become fairly chewy and a little bit dry - much like the standard bread rolls. But just pop them in the microwave for a few seconds and they are warm, moist and delicious once again. Available nationwide, across Canada and in Puerto Rico. Visit Fosse Farms Inc. for more information! Elaine Fosse began making salad dressings in 1987 because she was dissatisfied with the current market offerings - and I can't tell you how happy I am! Certified gluten free, soy free, dairy free, salt free, vegan and free of additives and preservatives, Elaine's line of dressings are healthy and delicious. With an ingredient list that reads "Pure Olive Oil, Cranberries, Vinegar, Sugar and Herbs" how can you go wrong? It is my understanding that as many ingredients as possible are produced on the farm, including the vinegar and berries, and Elaine sources her olive oil from California - creating a local and sustainable product grown and produced using West Coast ingredients. While I had the luxury of trying all of Fosse Farms' fabulous dressings, my personal favorite was the extra-garlic Blackberry -- lightly sweet, tangy and with a garlic taste that was pungent without being overwhelming. We loved it on spinach salads with goat cheese and walnuts, as a marinade for barbecued chicken, and as an interesting way to add an extra kick to your sandwich. Definitely a new favorite! Available in-store and at farmer's markets across Western Washington and Northeast Oregon and of course online, Fosse Farms dressings are most easy to find at Whole Foods. You may be thinking "Oh, just another salt-free seasoning alternative..." but that's where you're wrong! Jones' Mock Salt is a super delicious no-sodium seasoning blend that is gluten free, organic and produced in the Pacific Northwest. June Jones developed the seasoning over the past several years in an effort to help family and friends who suffer from heart conditions which require limiting sodium intake - and what a success! With a fine texture and complex flavor, what could be better? This seasoning blend is anything but bland and includes a few surprises - like orange peel - which creates a subtle blend of flavors that packs a big punch and lingers on the palate. For sure, Jones' Mock Salt is my favorite seasoning blend! Becky: First, go buy a quart of milk (if you don't already have some). Second, pour yourself a large, ice cold glass. Next, open your package of The Good Cookies, and just start eating. Trust me, you will be in cookie heaven. The taste of each and every of the five flavors of cookies are so unbelievably delish. My personal favorites? The Choc-o-holic, and the "Goodie Goodie" (Cranberry White Chip). All the flavors do have an overtone of peanut butter flavor (it's used in all the cookies - beware, those who are allergic), but it's not overpowering - except in the Peanut Butter and White Chip flavor, where it's the main attraction! - and honestly, all have unique enough personalities that the common ingredient makes no difference. OH yeah - these are called "GOOD" for a reason! 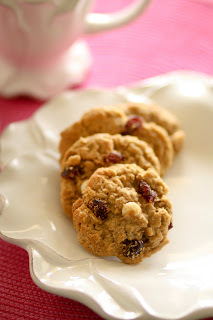 Kelsey: As someone who never liked oatmeal raisin cookies (in fact, I avoided them like the plague as a child) I was awed by these cookies. I wasn;'t totally in love with the general peanut-buttery taste, but it definitely does not detract from the five distinct flavors and isn't pronounced unless you a) eat all of them in one sitting (which I definitely did not do... at all... stop looking at me like that!) or b) are on the lookout for those nutty undertones. My favorite? The straight up Rais'n Shine and the Choc-o-Holic - yum! Becky: Homemade. Need I say more? Okay, yes, I'd better, because I feel like rhapsodising for a moment. These cookies have the soft and tender crumb I've been working so hard for in my own kitchen since I was a child. Each cookie is firm enough to not fall apart, yet delicate enough to literally melt in the mouth. Oatmeal, along with peanut butter, is another common ingredient, and for me that adds a nice element of interest. I also feel far less guilty eating these cookies (okay, okay, gorging on them, just keep it quiet) because I can convince myself that they're healthier for me! I kept thinking I'd like to make ice cream cookie sandwiches with these, and the texture is definitely right for that use: soft and moist, yet firm enough to withstand a little melted ice cream. Additionally, it's important to note that I kept these cookies in my freezer until review time (moment of truth - I ate a bunch before putting them there) and they lasted like a dream with no issues. Kelsey: The only thing stopping you from believing that you baked these amazing cookies yourself is that your kitchen is not perfumed with the aroma of freshly baked cookies and they aren't quite fresh-from-the-oven-warm, but really, that's it. They're just like homemade (because they are) and as far as I'm concerned, that's a win right there. They're just the right amount of soft & chewy and crunchy-cookie, perfect for light dunking, straight-up devouring or whatever else you could think to use them for. Becky: I felt like my Aunt Irma and Uncle Ollie had arrived for a visit when these cookies showed up on my doorstep. You see, they always brought these really delicious baked goods from a bakery near their house, and I always looked forward to tearing open the tissue paper to see what goodies they'd brought. The box arrived from The Good Cookies, and lo and behold, inside were two lovely bakery boxes. And inside the bakery boxes? Jaunty pink tissue paper. And inside the paper? Neatly packaged cookies, with really cool stickers detailing the contents, ingredients, and all the other necessary information. I've previously divulged that I tucked into a bunch of cookies before freezing them, so some of the plastic wrappers were opened already. Guess what? It didn't matter to the freshness of the cookies at all - they stayed fresh as the day they were baked, and as tasty, too. The only thing I'd hope to see happen in the future is a resealable wrapper, for those who aren't gluttonous like me. Who needs to worry about storage, though, when these won't really last that long anyway?! Kelsey: Bakery boxes. Pink tissue paper. What else do you need?! Oh, right, cookies. So of the remaining half that I didn't inhale (ahem), I put a few in a ziploc-type bag in the freezer, a few just in a baggie on the counter and left the rest in their unsealed cellophane wrapper (blasphemy, I know) and guess what? They all held up almost equally well. The freezer didn't work for me at all because when I want a cookie, I am not about to wait for it to slowly and delicately defrost but I also recognize the horrors of microwaving a frozen cookie (or at least, I do now! ), and while those in the sealed baggie did stay fresh after two weeks (my mandatory waiting time for baked goods), those left in the opened cellophane held up remarkably well. Obviously you probably won't just leave them out the way I did, but even if you do, they'll stay pretty darn fresh for at least a week. Wowza! 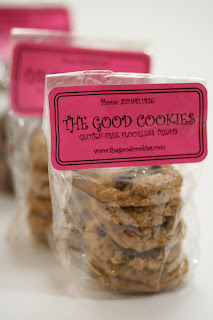 The Good Cookies website offers all the cookie flavors, sold by the dozen. They may also be found in various stores in the Los Angeles, CA area (including Malibu), and two stores on Long Island, NY. Hopefully word will spread (I've already started alerting my local stores) because these are a worthwhile addition to the gluten free bakery section of any market. Oh, heck - they're a worthwhile addition to ANY section - unqualified - of the baked goods aisle! On the website The Good Cookies sell for $8 per dozen. I think that for the home-baked quality and gorgeous custom packaging of these delectable (and generously sized) cookies, that's a pretty decent deal at sixty-seven cents per cookie! Shipping always adds more to the cost, if you are unlucky enough to not live in L.A. or Long Island, so be sure to budget for the added expense. Overall, definitely one of the most cost-efficient gluten free cookies I've tested to date. And well worth it! Glutenfreeda.com is a free gluten free cooking magazine helping those with Celiac Disease or gluten and wheat intolerances return to a normal way of cooking, eating and entertaining!